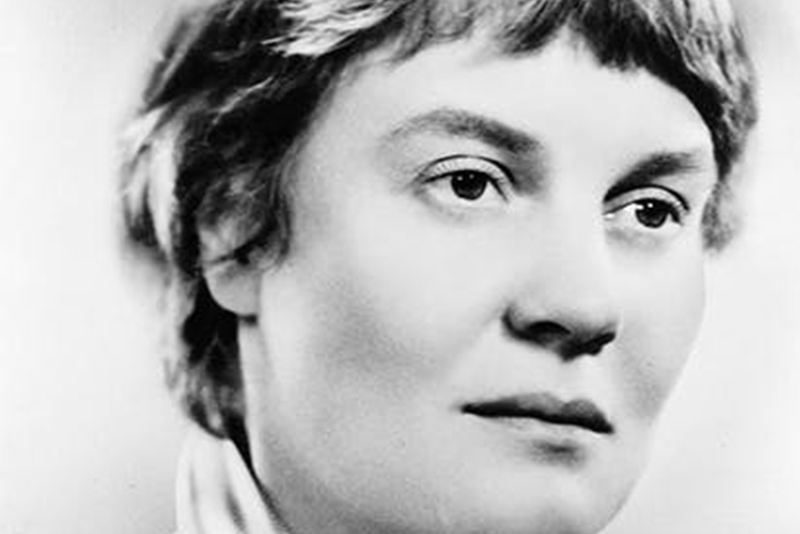 A portrait of the Anglo-Irish philosopher and novelist Iris Murdoch. Courtesy of Wikimedia Commons. By swotting the classics of Western morality, can one learn to be good? Philosophy is having a pop culture moment thanks to The Good Place, a sitcom about people in a place that may or may not be heaven, which poses this burning question. Viewers get to trace the inevitably perverse consequences that ensue when the characters act upon a particular moral principle. These principles are the work of a lineup of heavy hitters. Along with Plato, there is Aristotle, Hume, and Kant—batting cleanup, of course—as well as other perennial all-stars like Bentham, Mill, Kierkegaard, and more recent acquisitions like John Rawls and Tim Scanlon. Yet this roll call not only lacks a woman, but also—with the exception of Plato—a figure who was a creative artist as well as a moralist. As the centenary of her birth in 1919 approaches, the Anglo-Irish writer Iris Murdoch merits an audition. Not only is she the author of remarkable philosophical essays such as The Sovereignty of Good Over Other Concepts, The Sublime and the Good, and On God and Good, but also more than 20 novels including The Nice and the Good, The Philosopher’s Pupil, and The Good Apprentice. Clearly, The Good Place seems the right place for Dame Iris. Murdoch faced the question of goodness during World War II and its immediate aftermath. Between 1944 and 1946, the recent Oxford grad went to work in war-torn Belgium and Austria with the United Nations Relief and Rehabilitation Administration. Not only did Murdoch encounter scenes of utter devastation and despair—nothing short, she reported, than the “total breakdown of human society”—but she also met Jean-Paul Sartre. Impressed by his person and principles—diving into his work, she exclaimed it was “the real thing”—Murdoch was perfectly situated to ride the great wave of existentialism churning across the Channel. Fluent in French, she pored over the works of Albert Camus, Simone de Beauvoir, and Maurice Merleau-Ponty and, in her lucid and sinewy language, introduced these thinkers to an Anglo-American audience. The philosophy that she now believed we needed was the one that existentialism and the postwar analytic turn had left in the dust. Though close to the thinkers attached to Ludwig Wittgenstein, Murdoch declared herself a Platonist. What Murdoch found most compelling in Plato’s thought are the core claims that along with concepts like “Beauty” and “Justice,” the “Good” is real, but exists as an eternal standard in a transcendental sphere. No less important for Plato, once you truly perceive the “Good,” you have no choice but to act on it. While Murdoch was a serious student of Plato, it was Simone Weil, another French thinker, who made Murdoch rethink the nature of goodness. In particular, it was Weil’s notion of attention. For Weil, attention is another word for the supreme effort to truly know our fellow human beings. Ultimately, understanding the other comes only when we fully attend to her, and we can do this only by first suppressing our own concerns and needs. Nevertheless, in offering a Platonism for our age, Murdoch refined the architect’s original plans by moving the concept of the Good from the transcendental to the personal plane. Murdoch does not question that the Good exists outside of one’s private world—that it is real. What she does question is what we usually understand by reality and realism. The only reality worth its salt is the one where we hold the saltshaker—one that depends, in other words, on the working of our minds. Rather than conceiving of realism as a photographic or mirroring response to the real world, Murdoch argues that realism means that we inevitably introduce value into the world we confront. When we attend rightly to the world, we see it as it truly is. If only it were so easy. Getting in our way and blocking our vision are our very own selves. What makes the work of attention so hard, for Murdoch, is the “fat relentless ego.” She identifies the enemy, personal fantasy, as nothing more than “the tissue of self-aggrandizing and consoling wishes and dreams that prevents one from seeing what is there outside one.” In her formulation, the crux to the moral life is not our willing to do good, but instead our seeing the good. By pulling off the filter of selfish concerns, we wrest ourselves from what Murdoch calls the “mire” of egotistical desires and look at the world and others as they really are. One consequence of unfettering our vision is that we find that our self becomes a smaller and less compelling object. In Murdoch’s formulation, the crux to the moral life is not our willing to do good, but instead our seeing the good. In the end, Chambon-sur-Lignon became a place of goodness not because Trocmé and his parishioners read the great moral thinkers, but instead because they knew how to read the world. Their vision was clear because their egos were, if not suppressed, at least contained. Can one conceive of a more desirable, and simultaneously more demanding effort in our age? Though social media has increased our connections with one another, it has simultaneously made the task of seeing beyond the self more arduous—and also more urgent—than it was ever before. To read Murdoch is to be reminded of a standard—a standard that requires the putting of our fat relentless ego on a crash diet. If we had world enough and time, this would not be so pressing an issue. Murdoch’s claim that when we see clearly we have, in effect, already chosen what is good is wonderfully compelling. Yet as she also warns, we can only choose within the world we can see. Robert Zaretsky is a professor at the Honors College at the University of Houston. His latest book, Catherine and Diderot, is about the Russian empress and the French philosopher.